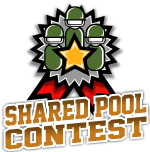 Tournament Madness Share Pools are a relatively new type of sports fantasy contest. You make picks against the spread and over/under totals from the opening odds released straight from Las Vegas sportsbooks. Each participant will be issued a starting amount of "Shares" to assign to each pick. So in essence it is a fantasy sports stock exchange in which each participant becomes a trader. At the end of the contest the trader with the most shares wins. The contest manager can customize your Tournament Madness Share Contest with a multitude of different options to control both the difficulty of the contest and rate of required trades to be made. You can risk shares on both the Side (pointspread winner) and the Total (the over/under). People can risk a lot of shares for each game or they can sit on the sidelines and not risk anything. What does a Tournament Madness Share Contest cost? A Tournament Madness Share Contest costs $9.99 per contest and includes up to 10 users, each user beyond 10 costs $1. However, you can create your own Share Contest today for FREE at no risk of being charged. If you find it to meet your expectations and needs you will be required to pay your invoice within 7 days after the pool starts by simply using one of our easy payment methods including Visa, Mastercard, Paypal or Paper Check. Does Contest General offer White Label Skins for Tournament Madness Share Contests?